There are dozens of neighborhoods both within and outside of the city that have been on the rise for many years now, each one offering a different way of living. These areas are sure to offer you the comfort and quality of life you seek while also securing a home in a neighborhood with appreciating property values. Some neighborhoods, like La Foresta, La Carolina and Guápulo, have become home for young, working professionals who want to be part of the vibrant city life. Other neighborhoods, like Cumbayá, Tumbaco and Puembo, appeal to wealthier Quiteño families and internationals who want to live in comfortable suburban condominiums with golf courses, restaurants, and bars, while still being able to commute to the city. Many international communities are developing in the Quito suburbs. Quito is known for having something for everyone, as well as an ease of living that comes with being the capital city-- embassies, excellent medical care, well-developed transportation systems, and international cuisine and culture. It’s no wonder that more young professionals, both Ecuadorians and internationals alike, are moving to northern Ecuador to take advantage of life in the capital city. Check out some interesting properties in Quito! 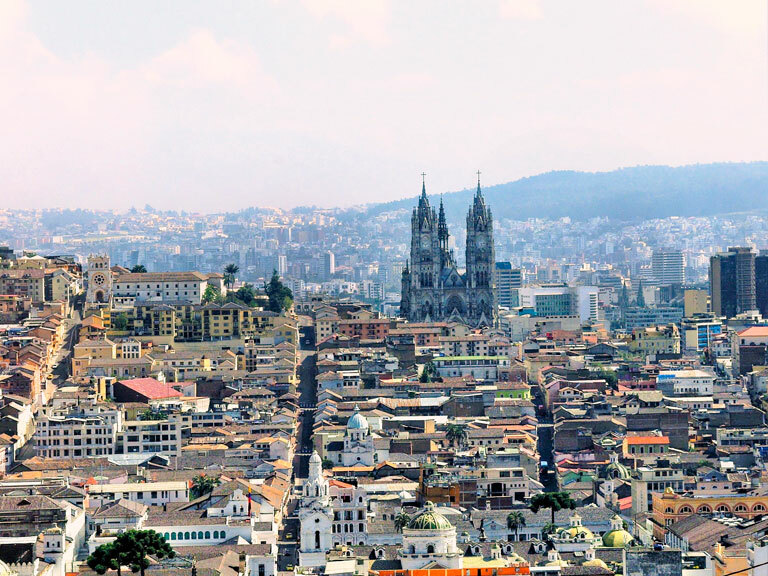 Although Guayaquil and Quito are the two main commercial centers of Ecuador, nobody can deny that Quito has long been one of the most influential cities of the region, both for its history and its strong economy. Tourism in Quito brings offers travelers and locals a ride up the TelefériQo gondola up to overlook the valley and see the volcanoes. They can also visit the most prominent cathedrals and museums in the country and stand at La Mitad del Mundo, the exact point where the equator crosses just north of the city. 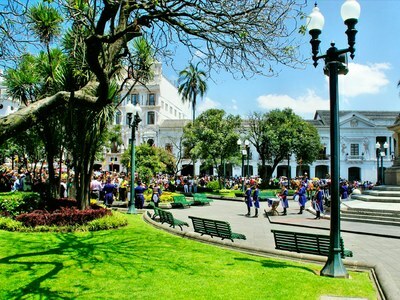 Tourism strengthens the economy, and through tourism, Quito has evolved into a cultural center of Ecuador. Downtown Quito is home to multiple worlds-- Old Town has towering cathedrals and indigenous museums, while New Town, home to neighborhoods like La Mariscal, showcases lively nightlife, coffee shops, independent movie theaters, and winding bike trails. Outdoor enthusiasts come to the city for the weather and variety of recreational activities. Average temperatures, even for this country located on the equator, are moderate, ranging from 40-75 degrees Fahrenheit. The city experiences a short rainy season between February and May, and the rest of the year is temperate with mild rain and lots of bright sun. Compared to other large cities in South America, Quito remains one of the most inexpensive cities. Living comfortably in the city center costs under $2,000 a month. That price includes renting an apartment, which ranges from $400-$1,000, as well as multiple nights out for entertainment, meals, and day trips. Taxi rides range from $1.50 to $10.00 to get anywhere in the city, and most locals rely upon taxi, bus, or the Metrobus. Food in Ecuador is also inexpensive, especially when compared to prices in Santiago, Chile or Buenos Aires, Argentina. A multi-course lunch ranges from $2.00-$3.50. Due to the abundant agriculture across the country and the fact that almost everything grows here, you can easily find inexpensive fresh fruits and vegetables in the markets, but you can also find imported speciality items at larger grocery stores. While a great dinner can be found for $10.00, there are also high-end restaurants with fine international cuisine whose prices pale in comparison to other cities. Music and dance concerts, as well as popular conferences like TEDx, also contribute to the cultural revolution of Quito. Working professionals in Quito have the same types of amenities offered in European countries or the United States, but they also get the chance to dive into Latin American culture. Depending on your job, Spanish is recommended. Many Ecuadorian corporations are branching out into international, English-speaking markets, but knowledge of Spanish can help secure these jobs. There are hundreds of inexpensive Spanish schools located throughout Quito, as well as private tutors that can help you learn Spanish faster for only $10/hour. There are also many international corporations, like HP, that have opened offices in Quito, so it’s possible to transfer your job to the city. For digital nomads, the ease of working virtually is nearly unparalleled. The neighborhoods, restaurants, and cafes are tech-friendly with great Wi-Fi. Finding reliable internet is never a problem. The city has developed a reputation as a start-up capital of Latin America. The city is rich in coworking spaces, venture incubators, pitch events and social entrepreneurship conferences. A large reason for this reputation is the high level of education in Quito. There are 9 universities in Quito, including the top-ranked Universidad de San Francisco de Quito. The city is also home to the first IB-diploma school in Ecuador, Academia Cotopaxi, as well as an American school, International schools, and other project-based learning schools. The abundance of education options makes Quito appealing for families with young children as well. To buy a property in Quito requires research: What kind of lifestyle do you want to live? What type of property do you want to buy? There are many popular neighborhoods in Quito. Old Town Quito, the historic center, is known for tourism. 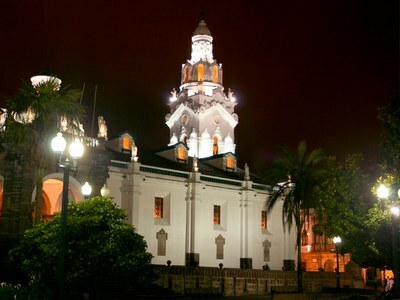 In Old Town Quito, you’re surrounded by classic cathedrals, convents, plazas, and colonial-style apartments. If you are interested in a more fast-paced lifestyle, then New Town Quito is where to look. La Mariscal and La Floresta are the two most popular neighborhoods in New Town for internationals and working professionals. Living in La Mariscal is like living in any large urban center; there are clubs, bars, internet cafes, hostels, and restaurants open all hours. 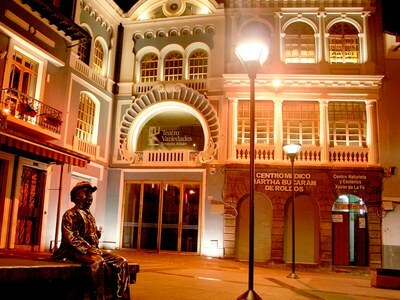 Plaza Foch is the epicenter of the nightlife in Quito. La Floresta, just east of La Mariscal, has an artsy reputation; it is home to coffee shops, bike paths, international cuisine, high-rise apartments and beautiful architecture. Homes for sale in La Floresta range from luxury condominiums to neo-colonial houses. If you’re not ready to buy a home yet, there are many inexpensive but comfortable rentals in apartment buildings and houses as well. 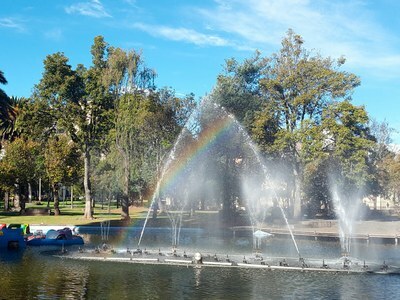 Just north of New Town is Parque Car olina, the largest public park in South America. Quito is one of the only cities in the world where you can live so close to urban amenities but still have the sanctuary of green space. Guápulo, also north of New Town, has emerged in the last few years as another popular neighborhood to live. The apartments and houses in this colorful district are built into the hills, and murals adorn the walls alongside the sidewalks. Rent prices in Guápulo range from $400-$1,000. With rising property value comes more development, more infrastructure, and more comfort, yet the current land value still makes it possible to find affordable property. In Quito suburbs, you can find land for sale that is ready for construction. Building a home in the suburbs is inexpensive compared to building in other large Latin American cities. Inexpensive labor, skilled construction workers and property managers, and high-quality, economical materials all make constructing a home relatively easily. Most of the land for sale is located northeast of Quito, by the airport. With the opening of the Mariscal Sucre airport in 2013 about 35 km from Quito, the suburbs surrounding the airport quickly grew into some of the most desirable property. The airport is located in Tababela. Since 2013, rising property values in Tababela, Puembo and Checa have developed these suburbs into desirable neighborhoods. Land prices have tripled in Checa, a small suburb with a community feel, and prices for square meter have risen by nearly $100 in both Puembo and Tababela as well. The suburbs outside of Quito have evolved into their own distinct communities. Cumbayá is one such popular destination; it is located 25 minutes from Quito and is at a slightly lower altitude, meaning warmer temperatures. Cumbayá attracts professionals and families who want to commute to the city for work or school but prefer living outside of the urban center. Tumbaco, located 14 km from Quito, is another popular residential center, especially for wealthier Ecuadorian families and the international community. It is bordered by rivers to the north and its subtropical climate is ideal for agriculture. Both of these neighborhoods, along with others like Tababela, Puembo, Checa, Cunuyacu, and Pifo, are popular Quito suburbs. Each suburb differs slightly in its commute time, average temperatures, and community vibe, but they all provide a chance for working professionals and families to live a more tranquil life while still accessing the amenities of an urban center.